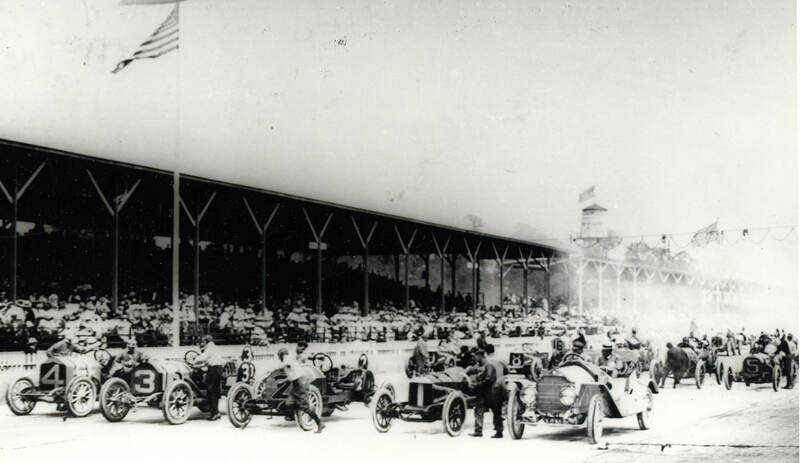 The Indy 500 entry fee before March 1, 1911 was $500 and increased to $750 through May 1, 1911 , the entry dealine. On February 28, 1911, one day before the initial US entry deadline , the American Locomobile Company submitted its fee for the Alco-6 Black Beast to be driven by Harry Grant for the "500-Mile International Sweepstakes at the Indianapolis Speedway, Memorial Day, 1911." 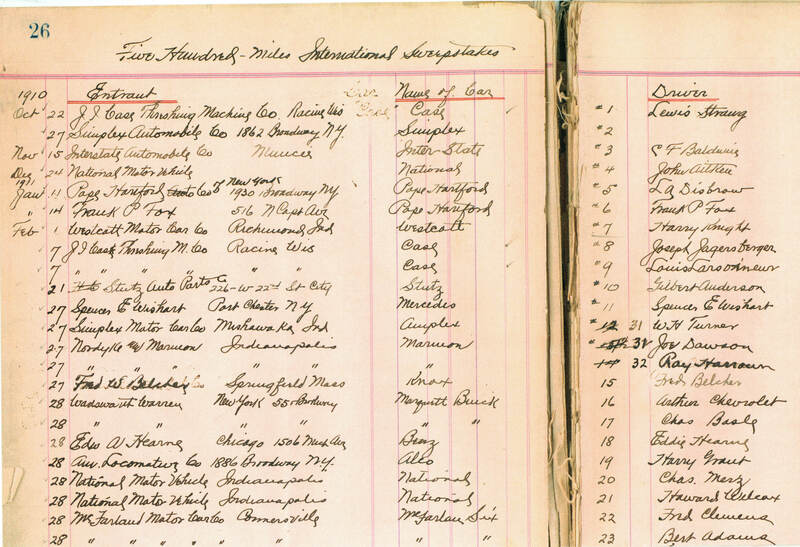 Since starting positions were determined by the date of entry on the official ledger, the Alco, listed on the 19th row, was assigned the number 19. (Ledger image courtesy of Mark Dill). Grant made three separate trials over the Long Island Course. His first was the fastest (107.8 mph). The other two half miles were drive in 17 seconds flat each. This is the equivalent of 105.1 miles per hour. Those who were privileged to see the performance were amazed at the power developed. Harry Grant, due to his two time victory in the Vanderbilt Cup race, is entitled to first consideration. 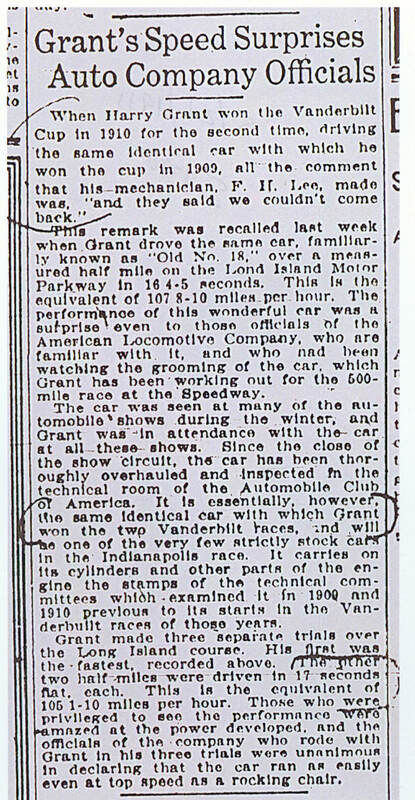 Grant is to drive the same Alco car that carried him home first in the 1909 and 1910 Long Island classic and he has announced his intention of following out the same system of driving he used on these two occasions. Grant drives at a consistent speed and is not the flashy spectacular type of pilot, who earns the applause of spectators during the early stages of a race and is never heard again of. It is Grant's style of driving that is going to bring forth a winner in the Decoration Day contest. Six of the entrants never made it to the starting line as two cars were not completed in time, two cars were damaged during practice and two cars failed the mandatory 75 mile per hour qualification test held prior to the race. 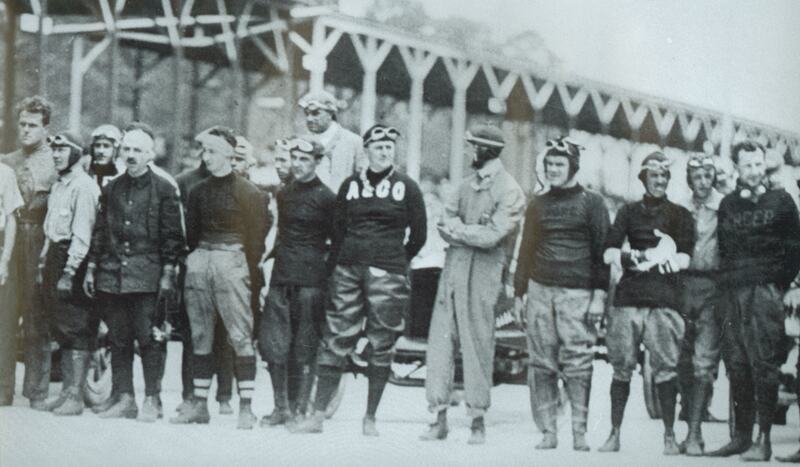 Before the race, the 40 drivers posed for a group photograph on the start-finish line. Harry Grant was easy to identify in his Alco sweater. 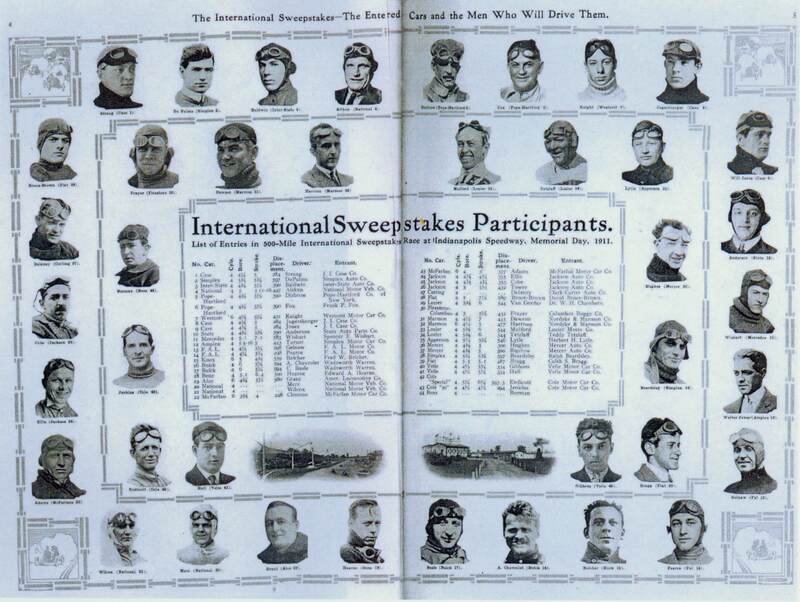 The 40 cars were lined up in rows of five cars and by order of their numerical entry.The exceptions were the first row which had only for cars and the Stoddard-Dayton pace car in the pole position driven by Speedway President Carl Fisher and the last row which only had a single car. 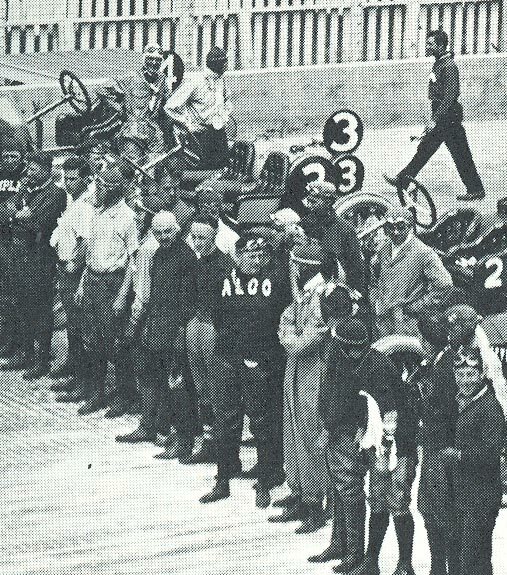 The Alco-6 Black Beast started in the center position in the fourth row. The cars were then sent around the track in their rows for a series of parade laps. 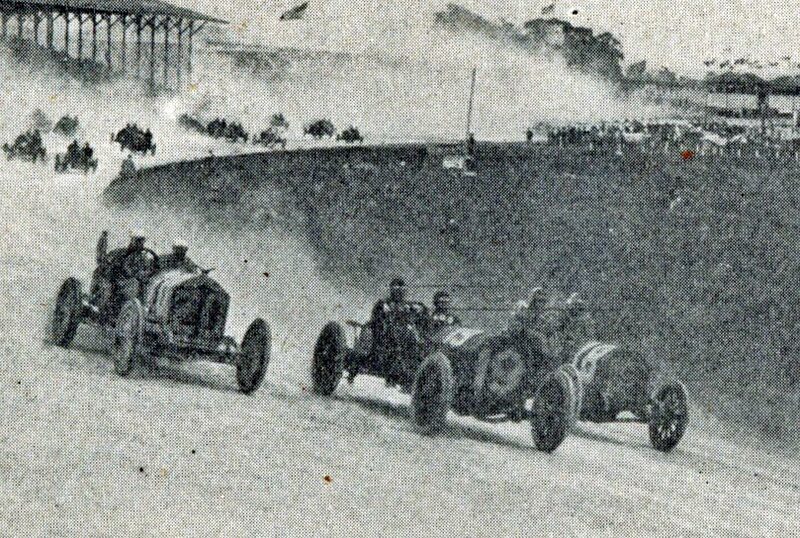 The #19 Alco with Harry Grant and Frank Lee was seen here between the #18 FIAT driven by Eddie Hearne and the #20 National driven by Charles Merz. 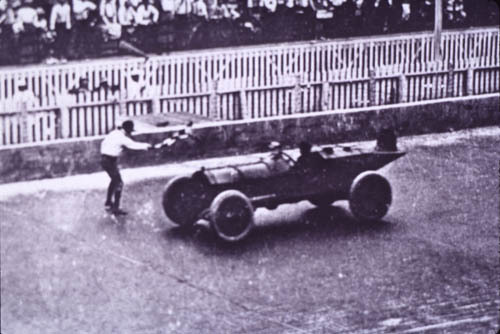 The 1911 Indy 500 Race was won by Ray Harroun in the #32 Marmon, averaging 74.61 miles per hour. By completing 51 laps, Harry Grant's Alco finished 33rd of the 40 entrants. 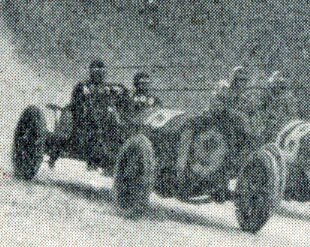 Automobile Topics, June 3, 1911: "Harroun Wins with Marmon"